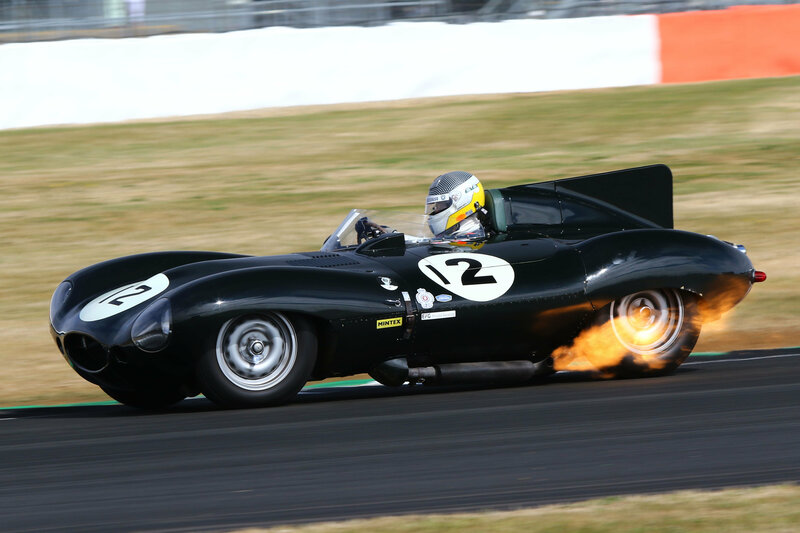 Over 100,000 visitors flocked to the final day of Silverstone Classic last month as it hosted a commemorative Tin-Top Sunday extravaganza; From stunning parades to superstar performances, it was truly an event to remember. Many of motor racing’s brightest stars came out to play on the third and final day of the 2018 Silverstone Classic to bring another memorable festival weekend to a shimmering conclusion. Dubbed Tin-Top Sunday in honour of celebrations to mark the 60th anniversary of the enduringly-popular British Touring (née Saloon) Car Championship, an illustrious line-up of high-profile drivers – both from today and yesteryear – lit up the timesheets on an exhilarating day of wall-to-wall retro racing. Together with an abundance of marvellous parades from dozens of the country’s top car clubs and a huge array of family-orientated activities to entertain eventgoers of all ages, the Silverstone Classic once again attracted in excess of 100,000 visitors to affirm its coveted status as the world’s biggest classic motor racing festival. With touring cars taking centre stage on Sunday to comprise four of the day’s ten races, the star attractions were out in force in the much-anticipated JET Super Touring Car Trophy with all eyes on legend of the discipline Rickard Rydell to see whether he could recreate his race-winning exploits in the 1998 Volvo S40, 20 years on from his BTCC title. After bringing the crowds to their feet by nosing into the lead early on, Rydell was ultimately forced to settle for second position behind the winning Honda Accord of James Dodd, who collected his second win of the Silverstone Classic weekend. Nevertheless, a third-place finish for 1989 and 1995 champion John Cleland in the Vauxhall Vectra ensured a popular podium line-up that fittingly evoked misty-eyed memories of the BTCC’s Super Touring heydays. Earlier on, one of touring car’s most successful modern-day racers Rob Huff swapped his technologically-advanced World Touring Car Cup (WTCR) VW Golf for the humbler but substantially more iconic Ford Lotus Cortina to claim victory in the Gallet Trophy for Under 2 Litre Touring Cars (U2TC) alongside Andy Wolfe. Huff – the 2012 World Touring Car Champion – and Wolfe finished 16secs clear of second place Andy and Maxim Banks in their Alfa Romeo Giulia Sprint GTA to secure one of the most popular triumphs of the day, with Wolfe the beneficiary of a beautiful heritage-inspired Gallet watch as owner of the winning car. Both Huff and Wolfe returned at the close of the event in the thundering Transatlantic Trophy for Pre ’66 Touring Cars, albeit in separate entries. Driving a Ford Falcon alongside Trevor Buckley, Huff was forced to settle for a hard-fought fifth-place whereas Wolfe powered to his second win of the day in the Ford Falcon Sprint he shared with Mike Gardiner. In the Historic Touring Car Challenge, father-son pairing Nick and Harry Whale surged to a dominant victory in one of the most successful saloon cars of its generation, the BMW M3 E30, ahead of Mark Smith and Arran Moulton-Smith in another of the Munich marque’s venerable vehicles. The riveting racing action was complemented by a show-stopping parade to mark 60 years of the BTCC featuring racing cars spanning six decades from a glorious Austin A105 Westminster as raced by Jack Sears to the inaugural BTCC (née BSCC) title in 1958, all the way to the 2017 BTCC title-winning Subaru Levorg GT as driven today by touring car legend Jason Plato. Despite losing out to a dominant Padmore on the road, Michael Lyons earned another podium finish in second place and was also awarded the Henry Hope-Frost #FEVER Award in honour of the much-loved late broadcaster and freelance journalist, who tragically lost his life in a road traffic accident earlier this year. Bestowed upon the driver who produced the most memorable high-octane moment from the weekend, Lyons earned the accolade as a result of his audacious around the outside pass on Martin Stretton’s Tyrrell at Stowe on Saturday. In the weekend’s second outing for the Masters Endurance Legends, Steve Tandy clinched a double victory at the wheel of his Lola B12/60 after prevailing in an entertaining race-long dice with Herve Regout driving the Lola Aston Martin DBR1-2. In third position, David Porter picked up a third-place finish in his striking Peugeot 908 LMP1, a modern icon of innovation that justifiably earned it the sought-after Stuart Graham Scarf & Goggles Award for the most admired competition car at the Classic this year. In the same race, six-time Olympic cycling gold medallist Sir Chris Hoy basked in more of the success he has become accustomed to during his staggering career with a P2 class-winning drive en route to sixth position overall in his Courage LC75, the Scotsman adding another milestone result to an already remarkable repertoire. Following its record-breaking parade on Saturday, Historic Formula Junior returned to the track in conclusion of a triumphant two-year Diamond Jubilee World Tour. Sam Wilson collected his second victory of the weekend to lift the Jochen Rindt Trophy for cars in period 1961-1963 driving his Lotus 20/22. There were also plaudits for Cameron Jackson, who made an exemplary charge to second place from 50th on the grid. Anthony Hibberd secured victory for Historic Formula Junior (1958-1960) in his Lola Mk2, while the Royal Automobile Club Woodcote Trophy for Pre ’56 Sports Cars went the way of Gary Pearson in his majestic Jaguar D-type. In the second Adrian Flux Trophy for Pre ’66 Grand Prix Cars (HGPCA) of the weekend, Peter Horsman in his Lotus 18/21 topped the podium ahead of Mark Daniell (Cooper) in second and Tony Wood (Maserati) in third. If the action was riveting on-track, the spectacle was simply resplendent off it as acres of exquisite machinery dazzled in the Silverstone sun. With thousands of beautiful automobiles taking to Silverstone’s hallowed asphalt to enjoy their own lap of honour over the weekend, it was the turn of the British Leyland 50th Anniversary and Sprite 60th Anniversary to revel in their moment in the Silverstone sun on Sunday. With each attending car club making an indelible contribution to the success of the Silverstone Classic, their efforts were also marked with coveted prizes. This year, a pristine example of a rare Aston Martin DB1 earned Allan Southward the much desired Yokohama Trophy for Club Car of the Show, while the Ferrari Owners Club was handed the Adrian Flux Trophy for the Best Car Club Display. Together with the huge variety of entertainment, including Mike Brewer’s Car Clinics presented by Haynes Publishing, tyre-shredding Streetcar Shootouts, the Yokohama Chelsea Skills Zone for budding footballers and the JET Village Green – complete with funfair rides and racing simulators – the 2018 Silverstone Classic provided a veritable feast of fun for the whole family like never before. Provisional dates for the Silverstone Classic in 2019 are: 26 – 28 July. All the latest news is available on the official website silverstoneclassic.com and via the event’s social media platforms.